Now concerning spiritual gifts, brethren, I do not want you to be unaware. You know that when you were pagans, you were led astray to the mute idols, however you were led. Therefore I make known to you that no one speaking by the Spirit of God says, “Jesus is accursed”; and no one can say, “Jesus is Lord,” except by the Holy Spirit. Now there are varieties of gifts, but the same Spirit. And there are varieties of ministries, and the same Lord.There are varieties of effects, but the same God who works all things in all persons. But to each one is given the manifestation of the Spirit for the common good. For to one is given the word of wisdom through the Spirit, and to another the word of knowledge according to the same Spirit; to another faith by the same Spirit, and to another gifts of healing by the one Spirit, and to another the effecting of miracles, and to another prophecy, and to another the distinguishing of spirits, to another various kinds of tongues, and to another the interpretation of tongues. But one and the same Spirit works all these things, distributing to each one individually just as He wills. Are you like most people who get excited unwrapping a gift as soon as you receive it? Every true believer of Jesus Christ is given specific spiritual gifts. God wants you to discover your spiritual gifts, to use these to serve Him in the body of Christ and be a witness to the world. The Fruit of the Spirit is focused on inner character. It concentrates on our spiritual growth towards Christlikeness. It has nine characteristics: love, joy, peace, patience, kindness, goodness, faithfulness, gentleness, and self-control (Galatians 5:22-23). Natural talents are special abilities that we are born with, such as athletic, artistic, musical, etc. Spiritual Gifts are focused on service. We operate in the spirit of love when we use these gifts. Our service ought to be motivated by love; otherwise they will have no eternal value. Everyone was born with natural talents, but spiritual gifts are only given when we have a personal relationship with Jesus Christ and when we are in-dwelt by the Holy Spirit. 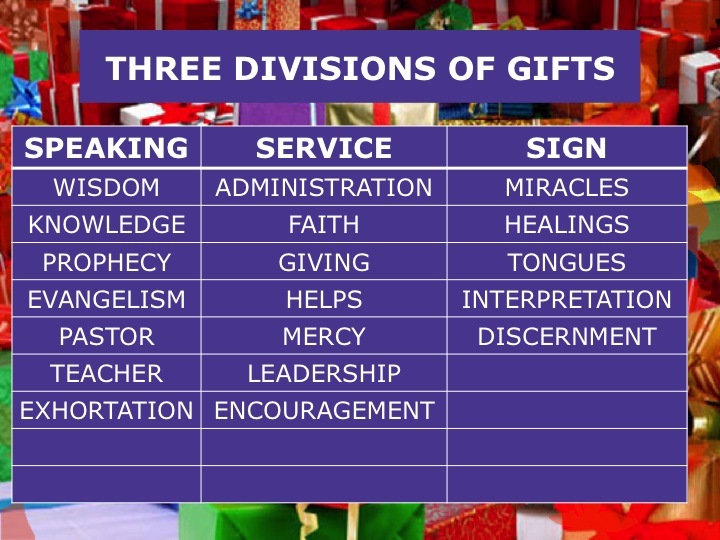 The Bible roughly mentions 19 spiritual gifts which can be classified into three main categories: Speaking, Service, and Signs. 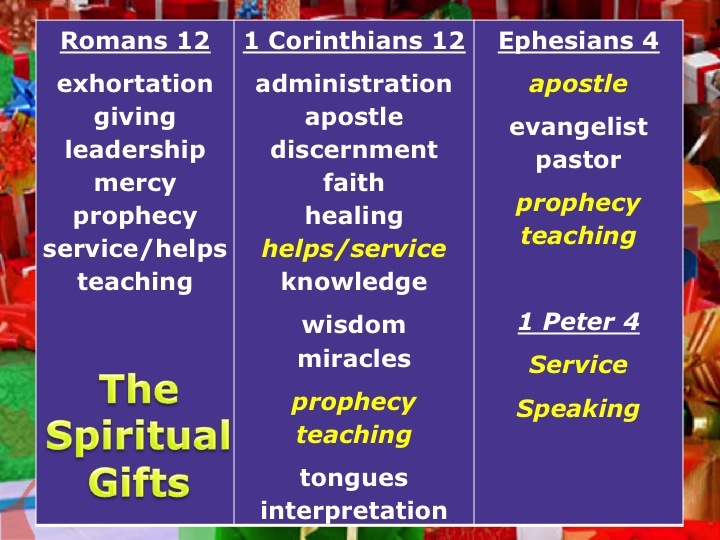 The Speaking gifts include wisdom, knowledge, prophecy, evangelism, exhortation, pastor/ shepherd, apostle and teacher. The Service gifts are administration, faith, giving, helps, mercy, leadership, encouragement. The Sign gifts are miracles, healing, tongues, interpretation and discernment [read Romans 12, 1 Corinthians 12, Ephesians 4 and 1 Peter 4]. Everyone is given at least one spiritual gift. There is no excuse for us to not serve God and the body of Christ. Gifts are given to us by God’s grace, we cannot boast about them. We cannot choose them, they are sovereignly bestowed. The gifts are given for the common good; not for ourselves. When we discover our spiritual gifts, we will be satisfied, the church will be edified and ultimately God will be glorified. When we come to Christ and allow the Holy Spirit to fill us, then we are given the privilege to harness our spiritual gifts, for without the power of the Holy Spirit in our lives, these things become ordinary talents and cannot be used to glorify God. How do I discover, develop and deploy my gift? 1. Pray and ask the Gift Giver to reveal it to you. 2. Do something! Look for opportunities to serve. 3. What are you passionate about? In which ministry do you see yourself getting involved? 4. Get feedback from trusted Christian friends and leaders who know you. 5. Take an assessment test to get an idea of what your gifts may be. And you can experience the JOY OF SERVING OTHERS. Here are some resources you can look into to discover your spiritual gift.